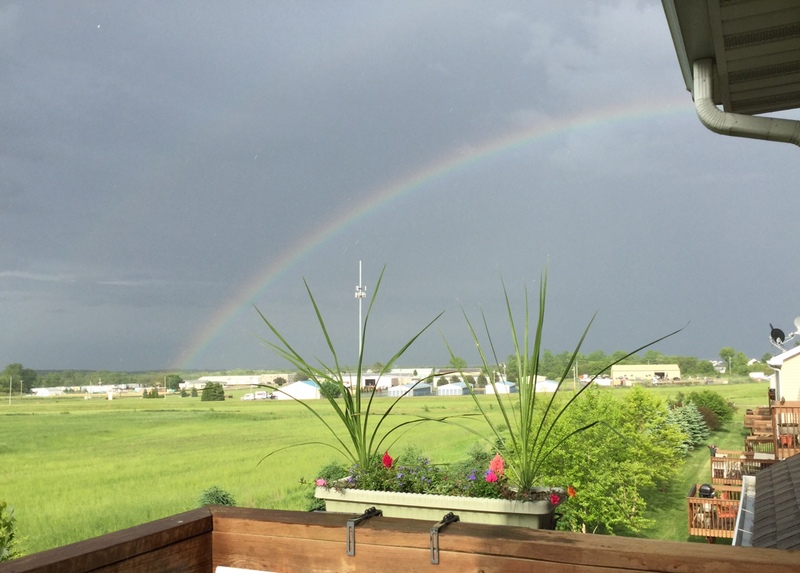 Thank you to everyone who shared pictures of the approaching storms Tuesday afternoon. While most of the severe weather stayed south of the immediate Stateline, there were some pretty impressive looking clouds that rolled through. This is a picture from Paul Hackerson from Stillman Valley earlier Tuesday. It's what we call a 'shelf cloud' and can sometimes be very ominous looking. There's a lot of stuff going on in the atmosphere to produce this type of looking cloud, and here's how it happens. 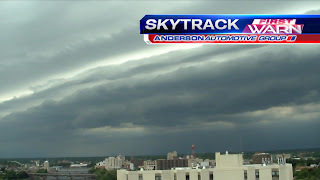 Shelf clouds are the leading edge of a gust front or an outflow boundary. 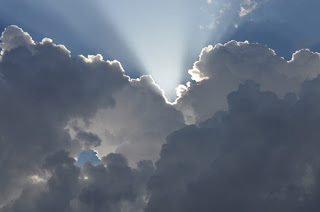 When rain cooled air hits the surface of the earth it spreads outward. When the air spreads out it forces the warm, moist air ahead of the thunderstorms northward. When that air condenses, it forms a shelf cloud. As the shelf cloud passes, you can feel a shift in wind direction and usually an increase in wind speed followed by heavy rainfall. Sometimes the wind gusts with shelf clouds can be very strong, upwards of 60 mph. Tuesday we had wind gusts near 40 mph. 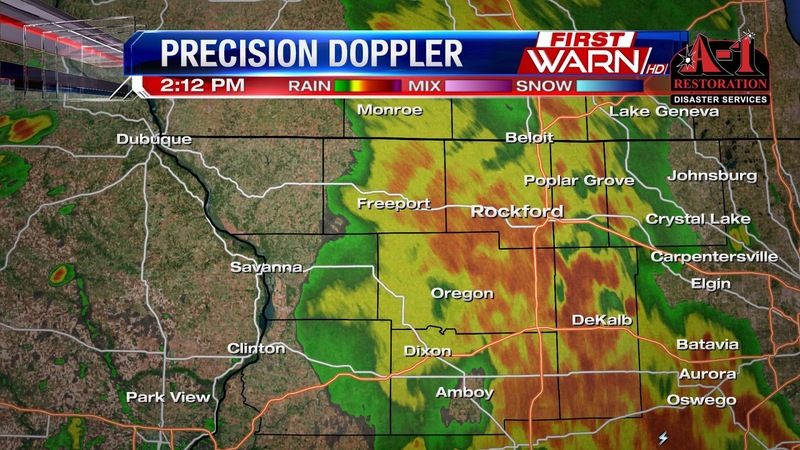 6:15pm Update: The heavy rain from Tuesday afternoon has now shifted east towards Chicago. 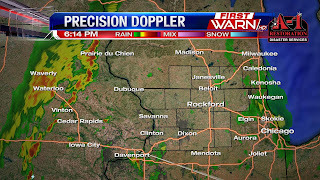 Skies have dried over Northern Illinois and Southern Wisconsin with only a few isolated showers developing to the west. 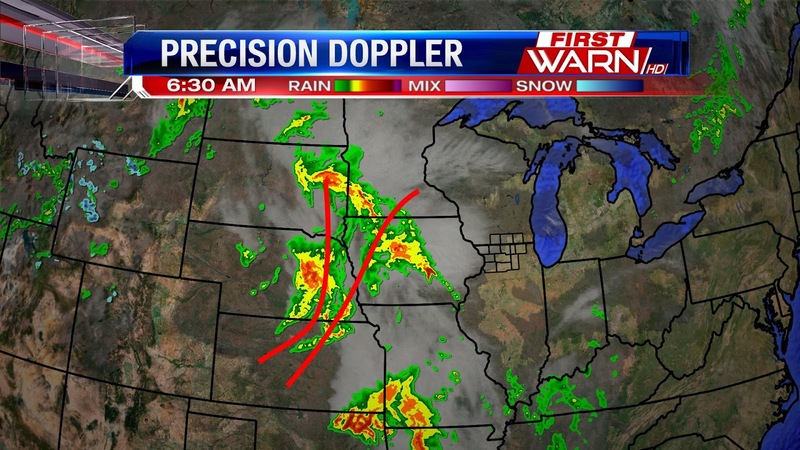 The cold front remains out west in Iowa and will move through during the overnight. So we'll keep thunderstorms in the forecast through Wednesday morning. High levels of moisture in the atmosphere per our meso-analysis is leading to the heavy rainfall most are experiencing from Highway 26 on eastward. If we were to think of the atmosphere like a sponge, we have essentially close to an inch and a half of moisture that these storms could possibly tap in to. 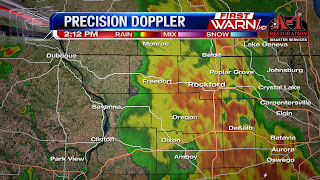 That means a lot of heavy rain until the storms weaken and move on. Weather Precipitation Discussion issued for northern Illinois and southern Wisconsin with the possibility for flash flooding. 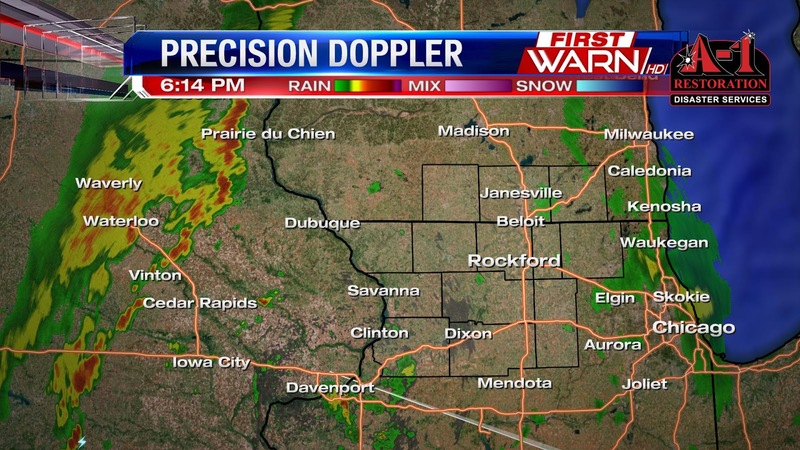 Storms will continue to develop and lift north over the next several hours with heavy rainfall. Rainfall rates between 1.5/2 inches per hour are forecast and this can lead to flash flooding. Especially to areas that have already seen a lot of rain. Never drive through a flooded roadway, turn around don't drown. 1PM UPDATE: General radar trends show the storms to be weakening and not posing much of a severe threat but heavy downpours will be with us as well a some gusty winds. 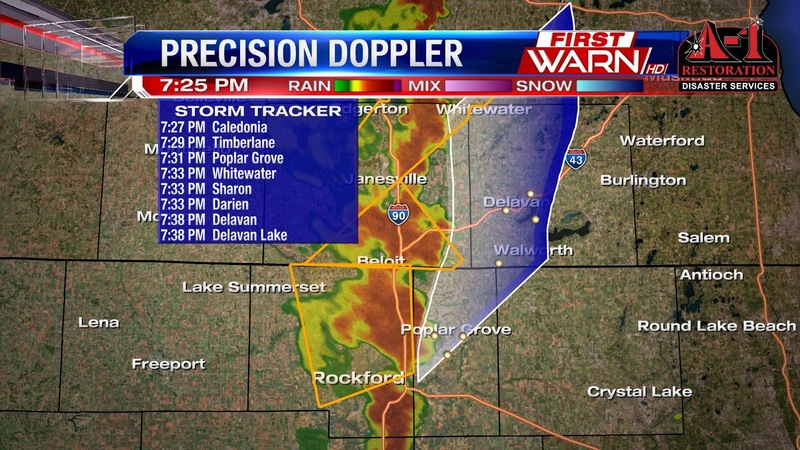 Timeline for storms in Rockford, Loves Park, and Footville. 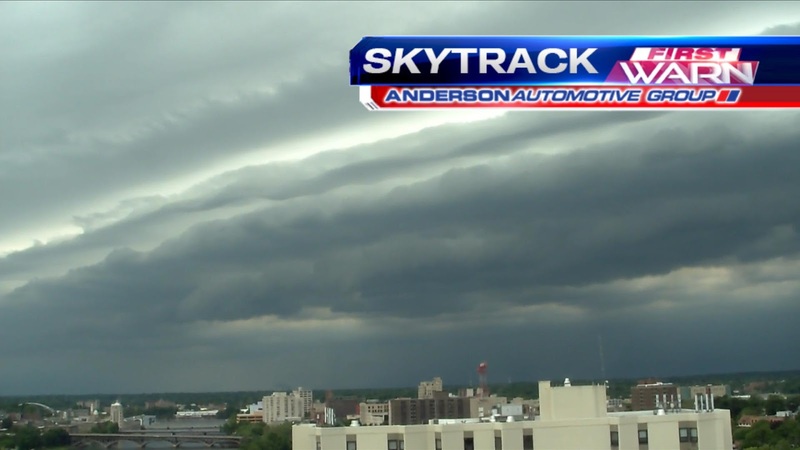 Shelf cloud moving into Rockford. 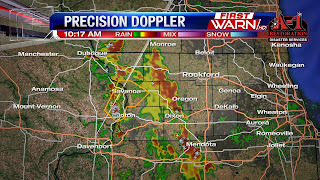 Non -severe storm but heavy rain and gusty winds. Heavy rain, gusty winds, and lots of lightning in Amboy with strong storm. 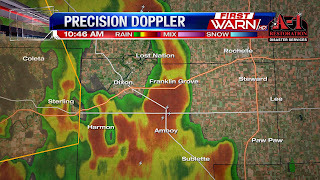 10:36 UPDATE Severe Thunderstorm Warning for Carroll & Whiteside Counties until 11:15am. 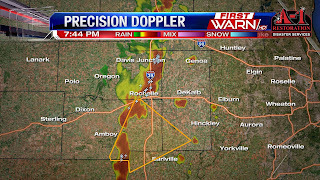 60mph wind gusts & nickel sized hail. 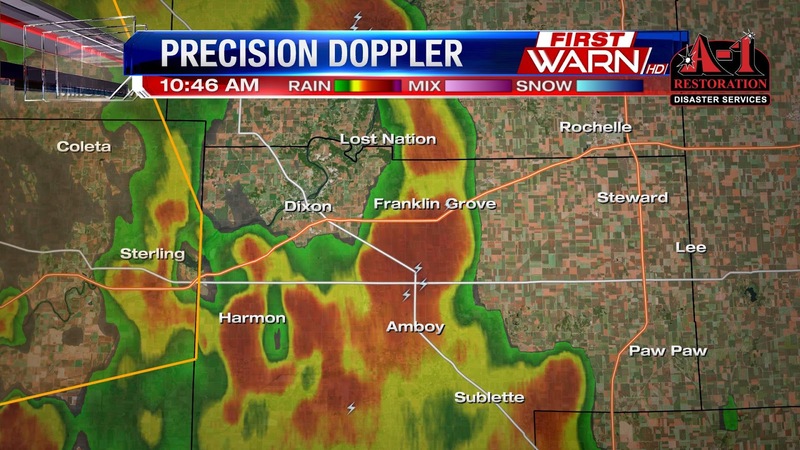 Severe Thunderstorm Warning for Carroll Co until 10:45am hail possible and heavy rain. 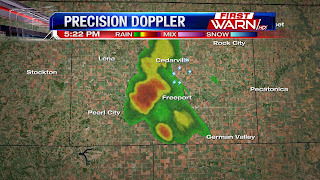 If you were up early this morning you saw quite the light show, will a thunderstorm that popped up east of Sterling overnight and early this morning. There was quite a bit of rain as well and lots of lightning reported as the cell slowly moved north northeast through Leaf River and Mount Morris. 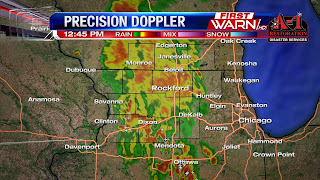 It then weakened over Rockford. 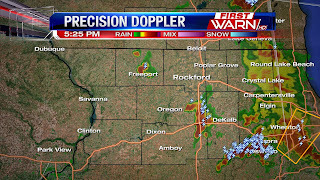 There's a lull in the activity for now but more isolated storms possible through midday, but already noticing a few more isolated showers and storms popping up just south of the Stateline, these will lift north northeast across northern Illinois. You'll want to keep the umbrella handy with mainly isolated storms through the midday and then we will notice more coverage this afternoon and overnight. The severe threat will be fairly low, but we could see a couple stronger storms that will be capable of heavy rain and gusty winds. 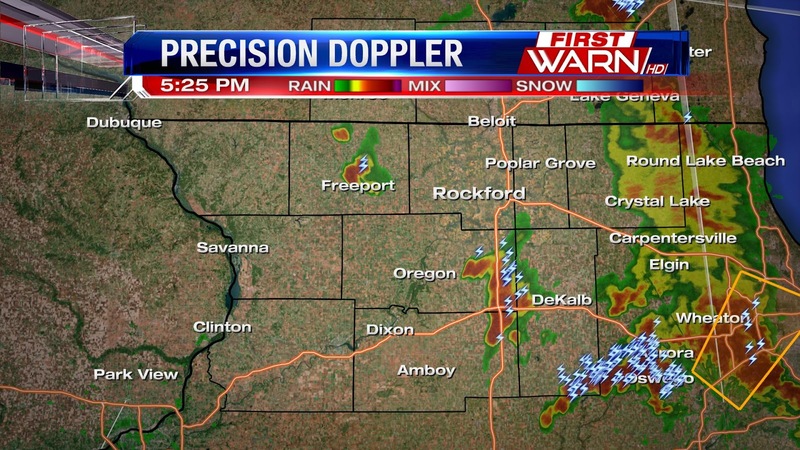 Even some smaller hail will be possible in a few cells. We will notice more scattered showers and storms Wednesday afternoon with again a Marginal severe threat. Its a level one on the scale which is low, but can't rule out a few stronger storms with gusty winds and heavy rain fall. Some futurecast models say half and inch to an inch and a half of rain is possible. 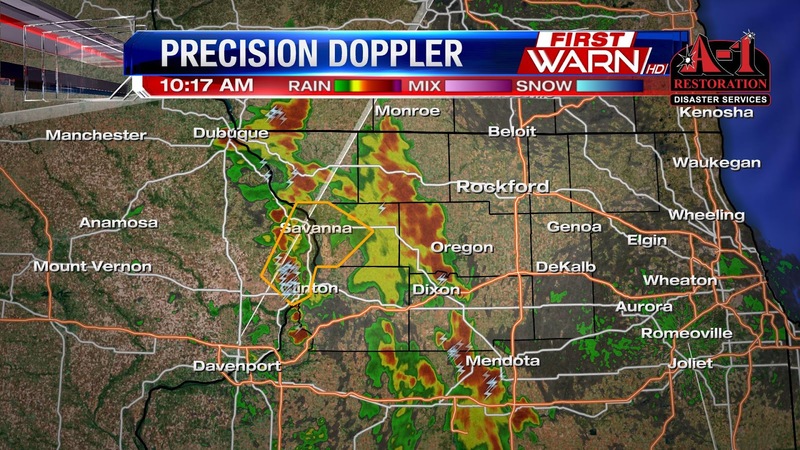 Locally higher is some storms as well with heavy rain biggest concern. On average, the month of May should receive 4.02" of rain. With only a day left, we've picked up just under three inches - 2.55" to be exact. There will be rain Tuesday, but it likely won't be enough to bring us up to the average before Midnight. This means the month of May, just like April, will likely fall short. This week does bring a chance for rain Tuesday and Wednesday, however, it doesn't appear to be a significant amount. Typically during the spring and summer months we need an inch of rain per week. This is because of the growing season with crops and gardens. That's also why our average precipitation typically is around four inches - one inch per week. The extended outlook for precipitation during the first week to week and a half doesn't favor the middle of the country, including Northern Illinois and Southern Wisconsin, with a high probability for rainfall. Let's hope this isn't a trend that sticks around into summer. It will be a warm finish to not only the month of May but also to the end of Meteorological Spring. 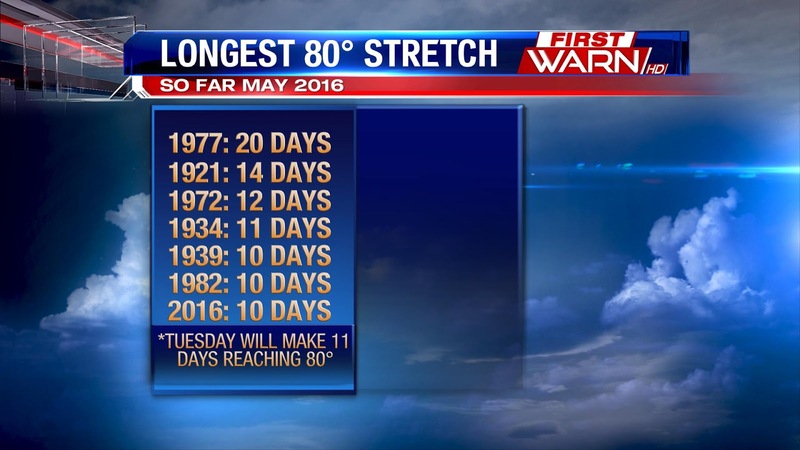 Including Monday, Memorial Day, the past ten days have experienced high temperatures either at or above 80 degrees! 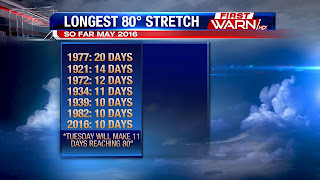 That's quite impressive and makes it the 7th longest stretch of 80 degree highs in Rockford during Meteorological Spring (March - May) since record keeping began in 1905. With a forecast high of 84 degrees for Tuesday, this would make it eleven straight days which would then tie this spring with 1934 for the 4th longest stretch of 80 degree temperatures! So if you thought the end of May has been warm, you're right! Unfortunately the warmth won't last into June. While we won't see a big drop in temperatures, we'll begin the new month with highs in the 70's. And according to the extended outlook from the Climate Prediction Center the first two weeks of the month could be cooler for the central and eastern United States. 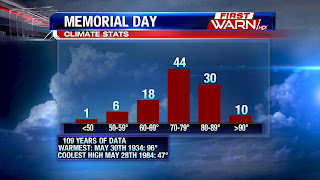 A warm Memorial Day with highs reaching the middle 80's, fairly close to the average temperature we experience during Memorial Day. Memorial Day is also typically dry in Rockford, with 55 of the 109 years dry and another 14 years with just trace amounts. I hope you have a blessed and happy Memorial Day today, and remember what the holiday is truly about! Picture perfect Memorial Day with temperatures warming into the middle 80's under partly cloudy skies. If you are headed out to 7th Street and 6th Avenue for Rockford's Memorial Day Parade temperatures will be in the low 70's under partly cloudy to mostly sunny skies. Winds will be light from the northwest, but it will be perfect for an outdoor lunch today. Temperatures by Noon will be in the upper 70's to right around 80°. High temperatures today will make it into the middle 80's with low humidity. 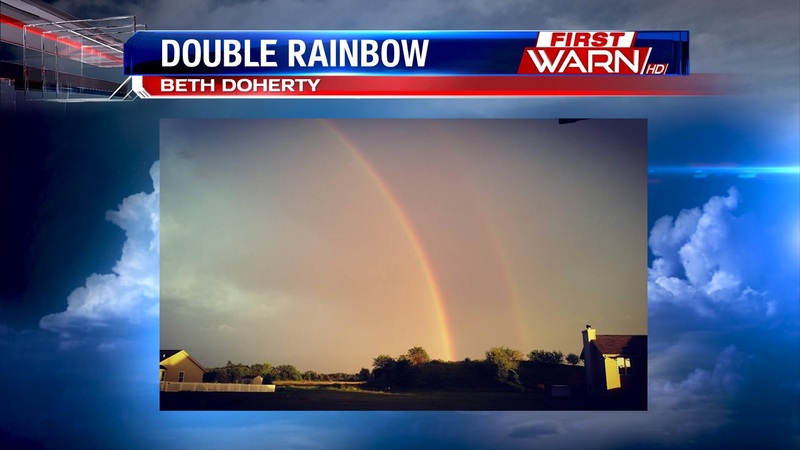 Take a look at some beautiful pictures we've received tonight after the line of strong to severe thunderstorms moved through. 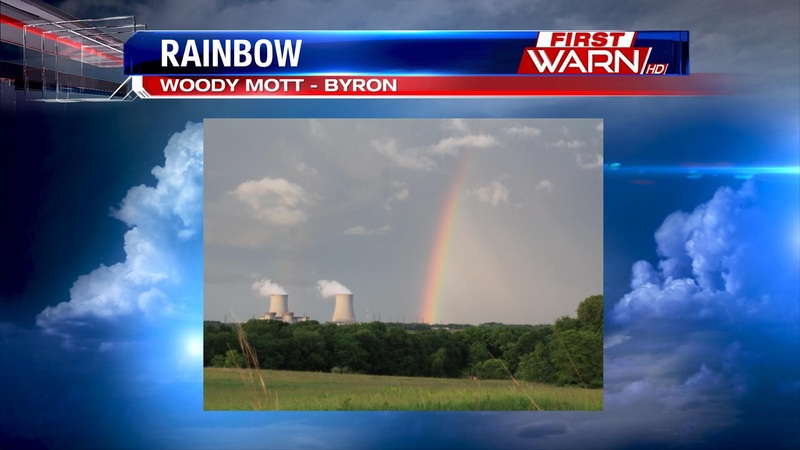 This first picture is from Byron of a vivid rainbow after the heavy rain exited the region. This photo depicts some mammatus clouds near the WTVO news station behind a strong thunderstorm. These are rare, but can happen in association with thunderstorms, especially severe ones. They are essentially cellular patterns of pouch-like clouds hanging below the main thunderstorm cloud. While appearing ominous, they usually only show up after the worst of a thunderstorm has occurred. 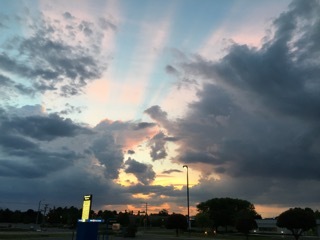 The picture to the left shows beautiful coloring in the sky after skies cleared behind this evening's thunderstorms. The photo simply does not do the colors we had justice. One of many shots of a double rainbow that occurred across Winnebago County. Here's an image from Machesney Park of a rainbow from end point to end point. Last but not least we have another photo of mammatus clouds behind a departing thunderstorm this evening. 7:47PM UPDATE: A Severe Thunderstorm Warning is in effect for eastern Lee County and southwest DeKalb County for wind gusts upwards of 60 MPH through 8:30PM. 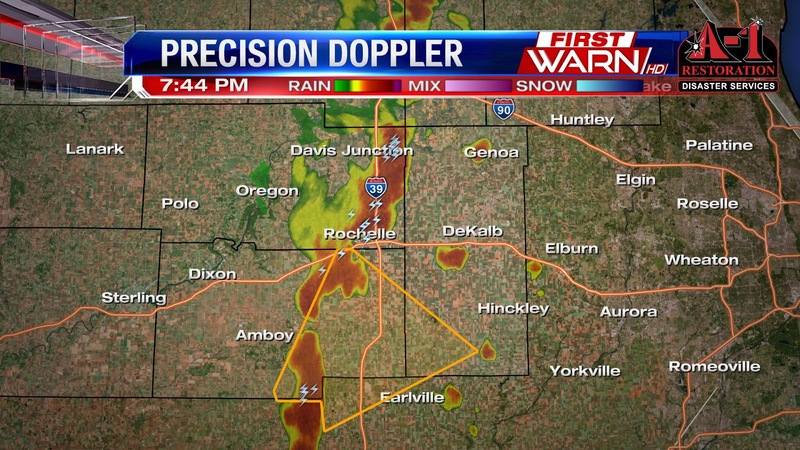 A strong thunderstorm is also located along I-39 from Rochelle to Cherry Valley. That storm will bring wind gusts upwards of 40-50 MPH. CITIES IN THE CLEAR: Galena, Freeport, Winnebago, Savanna, Sterling, Dixon, Oregon, Byron, Rockford, Polo, Amboy, Loves Park, Machesney Park, Roscoe, Rockton, South Beloit, Beloit, Mount Carroll, and Lanark. As of 7:20PM we are seeing Severe Thunderstorm Warnings with storms rolling through the region from southwest to northeast. 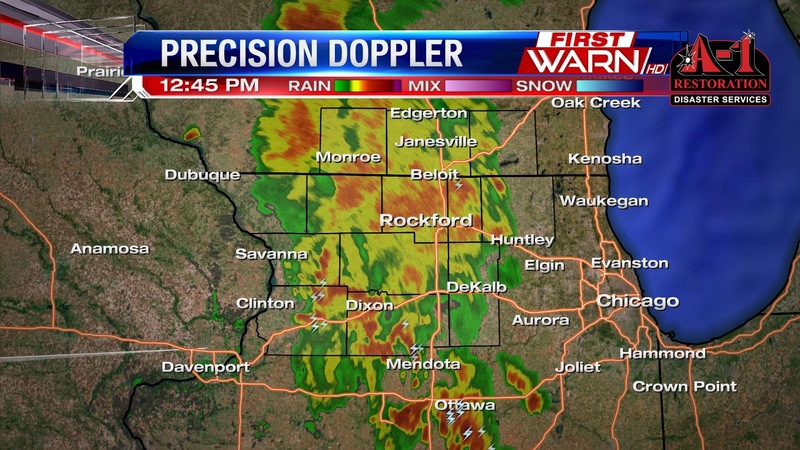 This includes Winnebago County & Rock County, but warnings could begin to be issued for Walworth, Boone, Ogle, Lee, and DeKalb Counties. 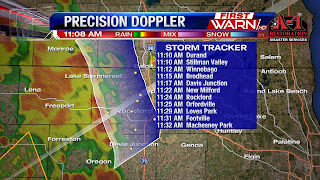 The storms are capable of small hail to the size of nickels and wind gusts upwards of 60mph. They are moving between 30 and 40 MPH so they will be out of here by 9PM. 4PM UPDATE: Scattered showers and storms are continuing to move northeastward towards the region. 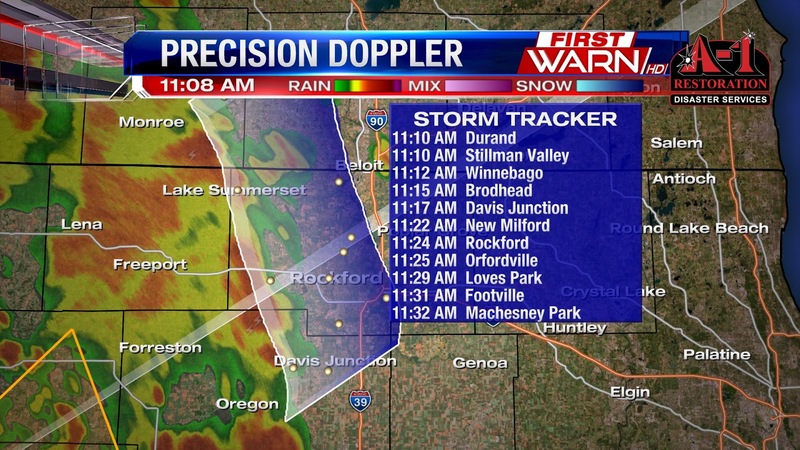 In fact, some rain is already being reported in western Jo Daviess County. 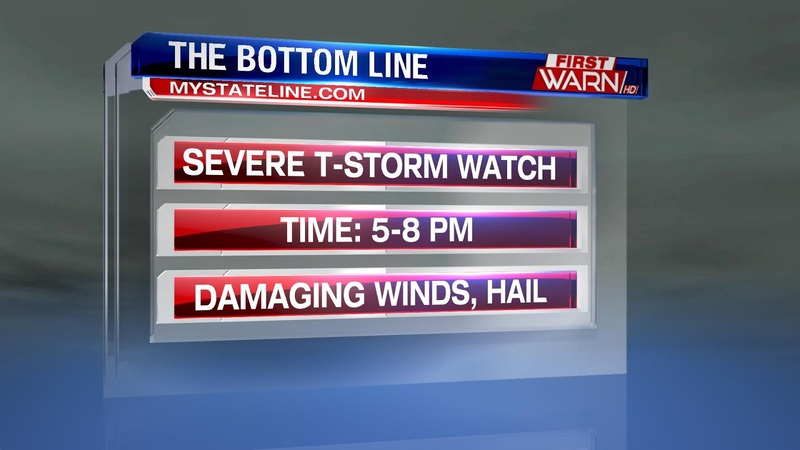 The storms will likely affect the region from 5pm until 9pm this evening. 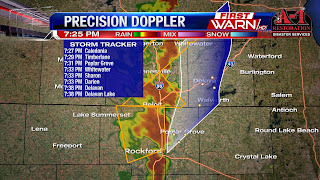 Damaging wind gusts to 60mph and isolated hail to 1" in diameter are the main threats with this line of storms. Will everyone see a severe storm? No. Are they a possibility this evening? Yes. It is advised that you prepare for rapidly changing conditions as these storms are moving in quickly. 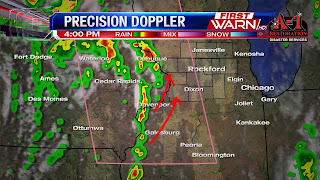 There have already been reports of small hail, damaging wind gusts and associated damage, and even a funnel cloud out of eastern Iowa as of 4pm. 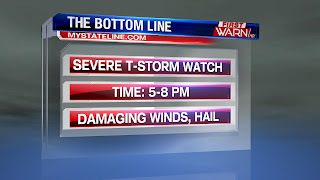 A Severe Thunderstorm Watch has been issued for parts of the Stateline through 9pm Saturday evening. Thick cloud cover from the morning has been gradually thinning with the heating of the afternoon and is causing the atmosphere to become unstable. 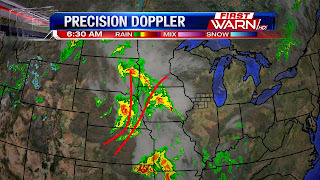 Low pressure and an approaching front from the west has caused thunderstorms to quickly develop over northern Missouri and southern Iowa. The general motion of these is from south to north, but an increase in storm coverage may occur over far western and NW Illinois by 4pm/5pm. 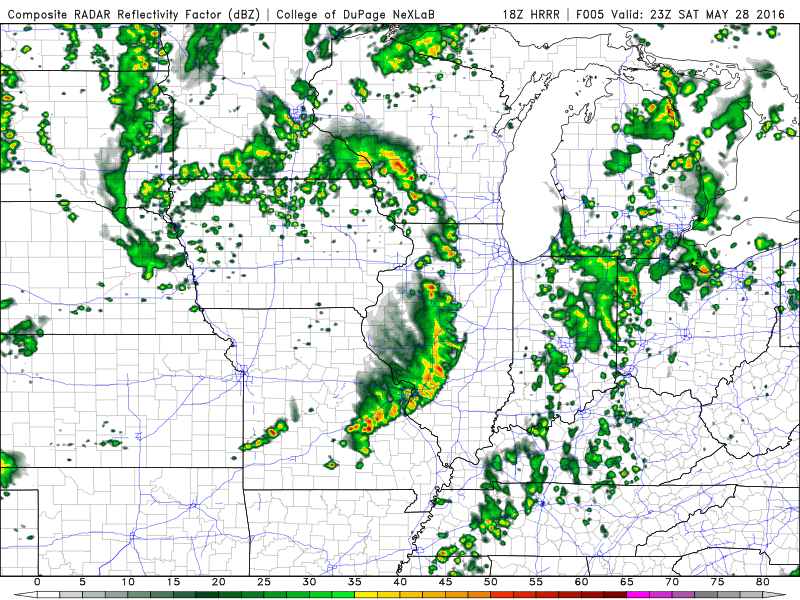 The image to the left is a simulated (forecast) radar image at 6pm Saturday afternoon. 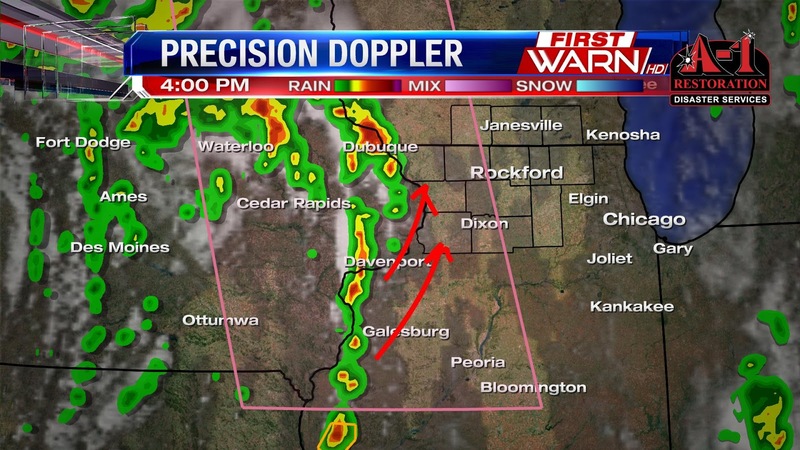 Likely scenario will be for a broken line of thunderstorms to develop and track north/northeast through supper-time. Be on the lookout for changing weather conditions later today and to bring any outdoor activities indoors if the skies become dark. Hot & Humid May; How about June? As you know, it has been quite hot and humid across the region of late. Not only that, but we have had plenty of showers and thunderstorms to contend with at times as well. That pattern can be blamed on the jet stream being positioned well to our north. That has and is still allowing warm and moist air to surge north from the Gulf of Mexico. As a result, we have seen high temperatures well above average in the 80s with dew points in the 60s to near 70°. So instead of May, it has felt more like July recently. But as we all know, weather changes all the time. That statement will reign true regarding the heat and humidity. Once we get by Memorial Day Weekend and the beginning of next week, models begin to show a change in the upper levels of the atmosphere. This will be a change that features the jet stream dipping to our south. That means we will begin to see winds from the north, which translates to cooler and drier air. While models suggest this will happen into June, there is low confidence on when exactly this pattern change will begin to take shape locally. One model (the EURO) believes the change will occur by next Wednesday. The GFS model suggests it won't happen until after the first week of June. So it's something we will continue to monitor, but it is with decent confidence that we can say cooler air will move in eventually. This holiday weekend looks to continue to be warm, humid, and at periods of time a little stormy. Not everyday will be as soggy, but there are a couple days that look to see more rainfall. Planning out the best chances for rain look to be both Friday and Saturday, especially in the evening. For your Friday you'll want to keep the umbrella handy with scattered showers and storms expected. A warm front will lift north today allowing for continued transport of warmth and moisture. We get several disturbances to rotate through the area today that will help to keep the threat for rain. Through Friday afternoon look for about a 50% chance while this evening that goes to about 60% making them a little more likely. The severe threat looks marginal, or fairly low, though can't rule out a stronger storm or two. Biggest concern in thunderstorms through the weekend will be the potential for heavy rain with dew points in the 60's. Favored area for strong to severe storms will be west of the area, closer to the low pressure system and cold front extending through Iowa, Missouri, and Oklahoma. However, can't rule out an isolated storm with gusty winds, again though we'll want to watch for heavier downpours. General storms continue through Saturday and Sunday with no real severe threat. Temperatures will stay in the 80's through the weekend and into next week. Sunday and Monday however will stay mainly dry with just an isolated shower or storm possible in the morning Sunday then more sunshine and same story on Monday. So, if you're planning on heading out to one of the many events this weekend, or want to hand out with loved ones, it won't be a total wash out but Sunday and Monday look to be on the drier side. The week of May 15th-22nd wasn't the greatest week with cool and damp conditions present nearly the entire week. This did slow the emergence of corn and soybeans. Statewide, the average temperature was 7 degrees below normal at 58.1 degrees. 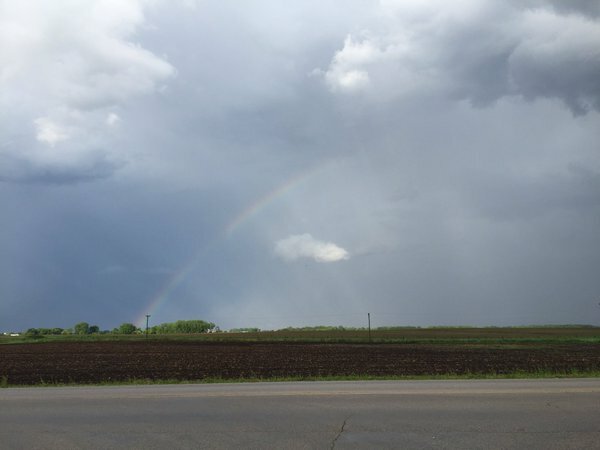 Precipitation was nearly half an inch below average. This week has been warm and dry, but it has actually helped a little in the emergence of corn and allowing farmers to continue planting. There has been just enough moisture to help sustain the corn that has been planted, but we do need the rain. And not the type of heavy downpours we've experienced the past couple of days. But rather a good, soaking rain. Hopefully this arrives Friday afternoon and evening. Corn planted over the state of Illinois is currently at 89 percent, down from the five year average of 91 percent. Corn emerged is up over its five year average at 77 percent, five year average is 68 percent. Soybeans are planted roughly a few weeks after corn and farmers have still been working in the fields to get beans in. Statewide, soybeans planted was at 51 percent, slightly down from its five year average of 55 percent. Soybeans emerged were at 20 percent, slightly down again from its five year average of 25 percent. Yet again, today's severe weather and overall thunderstorm risk will be centralized over the Plains from Iowa to Oklahoma. This area will have the chance of large hail, damaging winds, and tornadoes, much like what happened in Kansas on Wednesday. There is a minimal threat of strong thunderstorms in Illinois and Wisconsin -- mostly confined to this morning's thunderstorm activity. However, once we push into the afternoon hours the threat for thunderstorms will be significantly lower as we lose our main forcing mechanism (an MCV, or mesoscale convective vortex, is providing the lift and forcing this morning). There is no lack of moisture across the region for any thunderstorms to feed off of with dew points in the lower and middle 60s this morning. That is considered humid. That is also why we saw heavy rain with this morning's storms. The more moisture that is available to squeeze out of the atmosphere (aka, higher dew points), the heavier the rainfall will be. Once we head into the afternoon and these numbers get a chance to recover, we will be seeing middle and even upper 60s, which will make it feel very humid. Thankfully we won't be dealing with numbers in the 70s, which is considered oppressive. Here's a look at the different levels of humidity in relation to the dew point temperature. Of late we have see dew points in the 50s and lower 60s, which is comfortable to slightly humid. In the winter and fall months, you typically see dew points in the 40s, if not lower. Those values are considered comfortable to very dry (why you see chapped and dry skin in the winter!). Today through Memorial Day Weekend -- if not longer -- will feature dew points in the 60s to possibly near 70! That will make it feel very humid outside for the next week or so. So don't forget to stay hydrated if you are planning any outdoor activities this holiday weekend! (6:43:43 PM) nwsbot: Local Storm Report by NWS LOT: 2 N Somonauk [De Kalb Co, IL] emergency mngr reports TSTM WND DMG at 03:53 PM CDT -- around two dozen trees blown over or split. one tree was 5 ft in diameter. one tree down on house and cars. time of occurence estimated from radar. 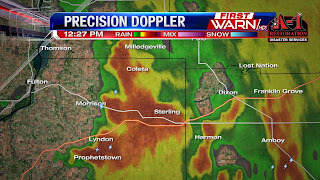 (5:40:43 PM) nwsbot: Local Storm Report by NWS LOT: 2 N Somonauk [De Kalb Co, IL] trained spotter reports TSTM WND DMG at 03:53 PM CDT -- numerous branches of 6 to 8 inches in diameter down on house and cars. relayed via social media. time of occurence estimated from radar. Storms over Northern Illinois and Southern Wisconsin have remained below severe limits, but have still packed quite a bunch with them. Staying mostly scattered the first round of thunderstorms are now moving towards Chicago. Following behind skies have cleared, humidity has gone up and additional thunderstorms have developed. These, too, will stay just below severe limits but pea to nickel sized hail, wind gusts to 50 mph and very heavy rainfall are all likely with any storm that develops between now and sunset. 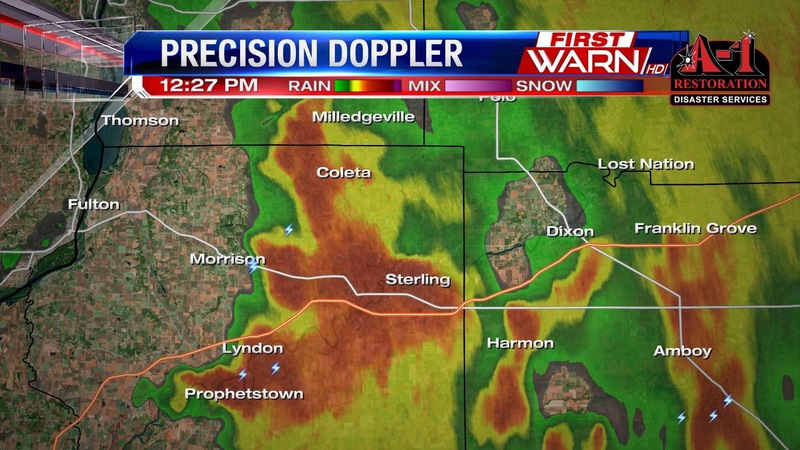 Be careful if you encounter these storms because the heavy rain will reduce visibility and cause ponding on some roads. 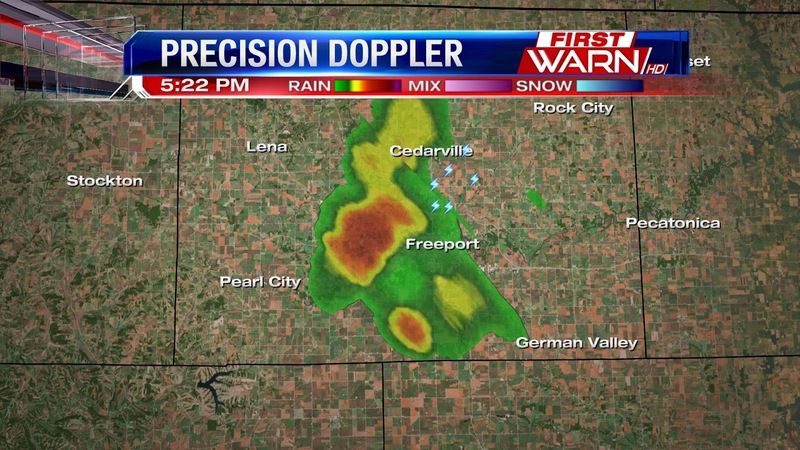 While I haven't received any reports from the storm near Rochelle and Steward, I did receive two reports of pea sized hail in Freeport around 5:15pm. It was a muggy start this morning with temperatures in the mid 60's dew points were in the upper 50's and low 60's. And now, those dew points are into the low 60's which is a very summer like feel. Dew points are a measure of the amount of moisture in the atmosphere, and right now we have quite a bit of it. That will help with the daily rainfall potential in the Stateline, rain is possible through Sunday but not every day will be a washout. Overnight strong to severe storms tracked through Oklahoma, Nebraska, and Kansas with Severe Storm Watches, Warnings, and even Tornado Warnings in Oklahoma. The storms have been waning just before sunrise this morning, essentially outrunning the 'forcing' available to sustain them. That forcing keeps the severe threat west of northern Illinois, and stretches through portions on Iowa, Minnesota, Kansas, Nebraska, Oklahoma. The forcing arrives from divergence in the jet stream in this area. Divergence is when winds speed up and spread out after slowing down when they traveled around the base of a trough that is in the plains. Divergence allows for lift in the atmosphere which then helps to sustain storms. More instability is available to the west, so this is the area that we will be watching for strong to severe thunderstorms to take place, though we can't rule out a couple stronger storms for northern Illinois and southern Wisconsin today, we'd likely see a few heavy downpours and a few stronger wind gusts. Thursday will be hot and humid, with dew points still in the mid 60's and highs in the upper 80's and close to 90°. Heat index values in the low 90's are also possible so make sure to stay hydrated! More widespread rain arrives on Friday once again, with temperatures in the 80's. Hit or miss rain through the holiday weekend but definitely not a wash out. Perfect weather to find an open pool! How Rare is May Frost? Chilly Weekend for Pec Thing! How Wet Was End of April?